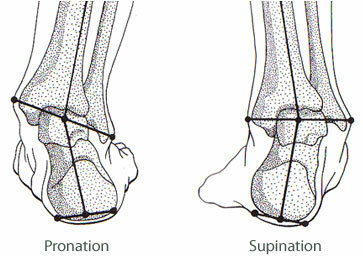 As with a neutral pronator, an individual who overpronates initially strikes the ground on the lateral side of the heel. As the individual transfers weight from the heel to the metatarsus, however, the foot will roll too far in a medial direction, such that the weight is distributed unevenly across the metatarsus, with excessive weight borne on the hallux. In this stage of the gait, the knee will generally, but not always, track inwards. An overpronator does not absorb shock efficiently. Imagine someone jumping onto a diving board, but the board is so flimsy that when it is struck, it bends and allows the person to plunge straight down into the water instead of back into the air. Similarly, an overpronator's arches will collapse, or the ankles will roll inwards (or a combination of the two) as they cycle through the gait. An individual whose bone structure involves external rotation at the hip, knee, or ankle will be more likely to overpronate than one whose bone structure has internal rotation or central alignment. An individual who overpronates tends to wear down their running shoes on the medial (inside) side of the shoe towards the toe area. When choosing a running or walking shoe, a person with overpronation can choose shoes that have good inside support -- usually by strong material at the inside sole and arch of the shoe. It is usually visible. The inside support area is marked by strong greyish material to support the weight when a person land on the outside foot and then roll onto the inside foot.